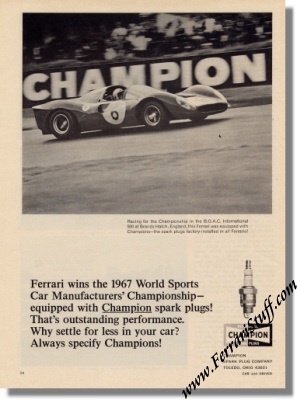 Vintage 1967 Ferrari 330 P4 advertisement for Champion Spark Plugs. 1967 ad for Champion Spark Plugs showing a Ferrari 330 P4. The ad shows the Ferrari 330 P4 Spyder S/N 0860 of Chris Amon & Jackie Stewart which finished second in the 1967 BOAC 500 at Brands Hatch. Measures approximately 8.5 x 10.5 inches.